Gella’s fiancé got so used to stray around freely in the Elistvere park that he allowed people to watch and photograph him. In 2018 The Animal of the Year camera will start transmitting from the lynx enclosure in Elistvere. 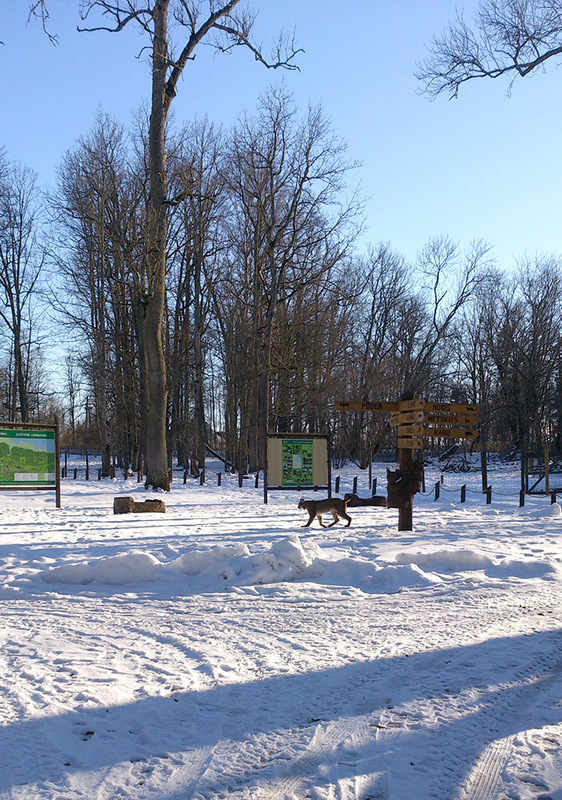 At present four lynxes live in Elistvere: the lynx mistress Gella, Tallinn male Lars, the secretive Grotto Lynx (locals call him Grotto Lynx because he likes to huddle near the old foundation blocks of the Elistvere manor) and one more younger lynx who was brought here only a few weeks ago. The last-named lives in an enclosure of its own and has not quite got used to the other species comrades. Where to install the camera then? To get an idea we went there a few days ago to look for a spot and checked where the local lynxes best liked to keep watch. For guide we had Elistvere visitors’ centre communication manager Elle Mäerand. The best place seemed to be at the lynx lady Gella because she likes to sit for long periods under the trees. There Lars too walks around. It is said about Elistvere’s Gella that she does not like the lynx males in the enclosure but instead wild lynxes. Last winter a lynx from nature came to visit her from time to time. It walked up to the enclosure and walked to and fro there. It did of course not get inside. Finally the strange lynx got so used to the locals that it allowed itself to be watched and photographed by people. Will it be back this winter? Will it show itself to us ? The lynxes will surely get used to the camera and we to them. If we cannot get the lynxes into camera view we will relocate the camera and it will surely function. We look particularly for information on what happens in darkness. No workers or visitors move around then.